"No man left behind" is inscribed in the DNA of every SEAL and Lieutenant Diego Torres is no exception. But with a team member killed—and the body missing—Diego's honor is sorely tested. Now his career and reputation are on the line, and a traitor is hiding among them. Diego wants answers…and only one woman has them. Single mom Harper Maclean has two priorities—raising her son Nathan and starting a new life. Her mysterious new neighbor may be impossibly charming, but Diego asks too many questions about her past—and about the father of her child. Questions she fears will reveal her burning attraction for Diego, and ultimately put them all in danger's path. 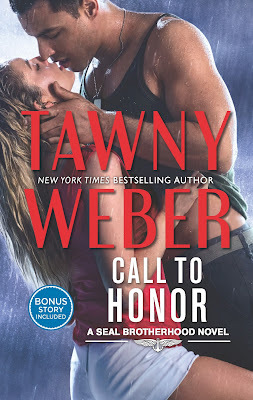 Call to Honor is the explosive beginning to Tawny Weber's new series, SEAL Brotherhood, which follows the elite Poseidon team. Diego Torres couldn't imagine being anything other than a SEAL. When he made the decision to rise above a life of gangs and violence, he made a commitment. It's unthinkable that a fellow SEAL would betray his own, but when Brandon Ramsey is killed in action, and his body isn't found, Poseidon is put under investigation. Diego and Jared Lansky are ordered by their team leader to quietly investigate the matter of Brandon's death. Could he really have betrayed the team to sell classified information? Was he working alone? Diego is positioned next door to Brandon's former girlfriend and mother of his child. If he's still alive he might run to her for safety. Harper Maclean puts all her energy into taking care of her son, Nathan, and distancing herself from Brandon's abandonment. When Harper and Diego meet sparks fly and romance takes over the plot. I really loved reading Call to Honor. 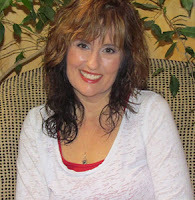 Tawny Weber is a talented author who knows how to engage her readers and keep them hooked throughout the novel. It was a little hard reading at the beginning, however, because she introduces quite a few characters from the SEAL teams. It took me a few passes over certain scenes to understand who was talking or where someone was directing their glare. Despite the confusing opening scenes, though, I wanted to race through the story to the end. Diego and Harper were so good together. You can't read their story and miss the connection. I have no doubt the rest of the SEAL Brotherhood series will be just as fascinating as Call to Honor!